This year’s San Francisco International Film Festival officially opened last night at the Castro, with a screening of The Two Faces of January. It was, as you’d expect, a packed and festive occasion. But it got off on a bad note, and an all too common one at festival big nights at the Catro. Almost the entire center section of the house was blocked off as "reserved." Some rows were blocked off for filmmakers, others for the opening night sponsor, RBC Capital, and others just blocked off. If you were simply a regular moviegoer who had bought a ticket, you had to settle for the side sections, the balcony, or the front six rows of the center section. Luckily for me, I like sitting front and center, and was quite happy in the second row. It was a pretty full theater, but not entirely full. One seat next to me was empty. Well before the 7:00 start time, we were treated to an organ concert and the usual SFIFF slide show. The organ was in it’s highest position, blocking the screen. No big loss. I know I’ll be bored with that slideshow soon enough. At 7:07, the organ concert ended, the lights went down, and the new Executive Director, Noah Cowan, took the stage. It was, as he acknowledged, his first time "on stage a the Castro." Cowen gave the usual thanks–to his staff, his predecessors, and of course the sponsors. It’s a pity that a great institution like the San Francisco Film Society has to go begging to corporations, but that’s the world we live in. Director of Programming Rachel Rosen came up next. She talked about communities, both of film lovers and filmmakers. Then she introduced Hossein Amini, who wrote and directed the night’s film. The Two Faces of January is Amini’s first film as a director, although he’s well established as a screenwriter (The Wings of the Dove, Drive). "I’m normally a writer who works on a computer," he told the audience, "so it’s nice to get out and be a director." He talked briefly about the Patricia Highsmith novel the film is based on. He had read it years ago, back when he was in college. The movie starting at 7:19. That’s extremely punctual for a festival opening night at the Castro. . The less you know about this thriller when you walk into the theater, the more you’re going to enjoy it. This is the rare thriller that gives you time to become familiar with the characters, lets you wonder if any of them are evil, then draws them into a life-or-death situation that seems all too plausible (at least while you’re watching it). 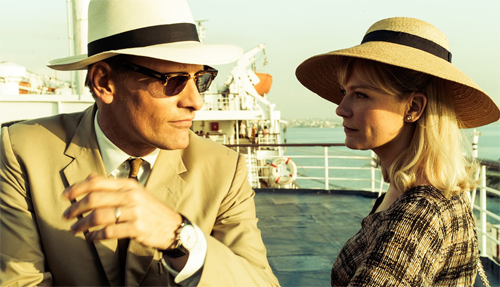 It follows the fortunes, and mostly the misfortunes, of three Americans (played by Viggo Mortensen, Kirsten Dunst, and Oscar Isaac) spending what’s supposed to be leisure time in Greece in the early 1960s. Their predicament doesn’t remain leisurely. The slow pacing helps make The Two Faces of January such a wonderful film. Not only does it allow the story and the characters room to breath; it also adds to the suspense. On why he adapted a novel he’d read decades ago: "It just kept coming back. I kept re-imaginging it in my mind." On his approach to adaptation in general: "You read a book and you feel you have a special understanding. I had a real intimate relationship with this book. That’s adaptation. I just recognized things in myself….If the book has strong characters, you can add new scenes and change things and still be loyal to the book." On preparing to direct: "I directed it in my head when I wrote it. I storyboarded everything. we didn’t end up using the storyboards that much." One audience member asked if directing changed his writing process? "You lose a certain innocence You think about budgets and shots. It’s something I recommend all writers do; stay involved with the filmmaking process. The more writers get involved with that, the more they become better writers." There was a party afterwards, but I chose not to attend. I needed a good night’s sleep. The Two Faces of January has been picked up by Magnolia Pictures, and will get a theatrical release, probably in September.